Since samples of Benefit’s new mascara launch Roller Lash hit the shelves as a freebie with March’s Elle, everyone has been raving about it – it really is the best mascara I’ve used in a long time, providing length and curl that lasts all day. If you are frequent around these ends (aka my little corner of the internet) you will know I’m really fussy with mascaras too, so this really is the highest level of award they can expect to receive EVER. You’re welcome Bene-babes. 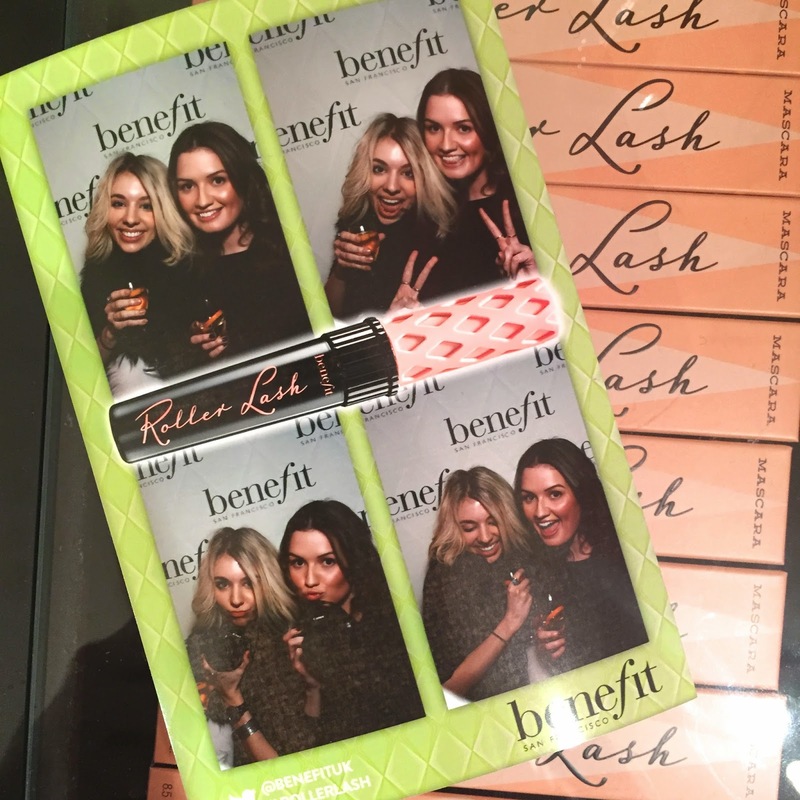 To celebrate Roller Lash’s official launch yesterday, I was lucky enough to be invited to a preview of their Curls Best Friend Pop-Up Parlour in Soho, London, with my blogger bestie Becky. The Pop-Up consists of three floors of sweet sweet Benefit goodness that is essentially all my girly dreams rolled into one! Benefit are renowned for their instantly recognisable colour schemes and campaigns (*claps design team*) and the pop-up depicts everything you would imagine – pastel colours, novelty decor (hairdryer lights? Do they sell those in Ikea? Lemme know) and probably the chattiest, most smiley team you could ask for! You walk in and find the ground floor celebrates Roller Lash, with drinks and sweet treats aplenty – I recommend the elderflower and champagne (necked two glasses like a lad on tour, naturally). The second floor is where you will find the beauty parlour that I just adore. 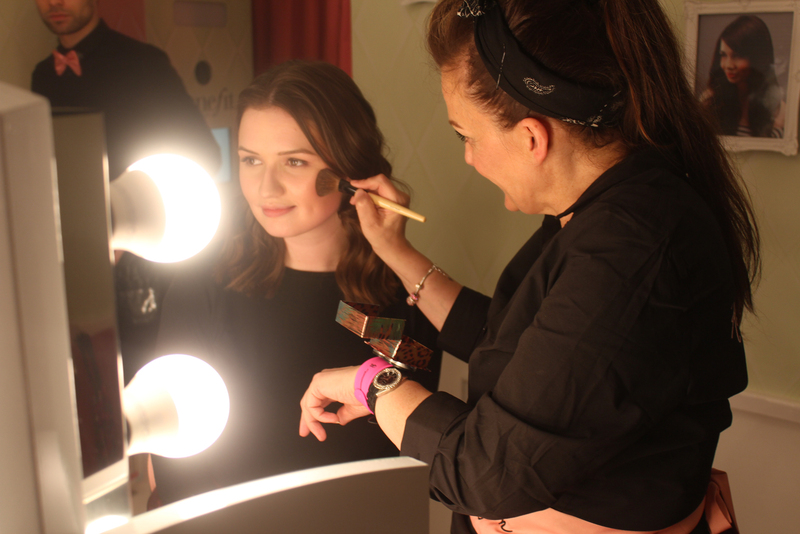 The staff are so lovely and you can treat yourself to having your hair styled, your make up topped up or a brow wax and tint, all by the Benefit professionals themselves. I went for Hollywood curls (why can’t I have a live-in hair stylist to do this for me everyday? #Goalz) and had my make up spruced up by the very lovely Alyson Rowe. There’s also a photobooth – everyone loves a photobooth! The top floor, named the Noir Bar, opens from 7pm and is a nod to Benefit’s cult They’re Real mascara. The floor is very dark and chic, with a really intimate feel. Here you can drink yourself silly with aaaalllllll the cocktails (although the winding staircase may not be so kind to you after such indulging). The Parlour is open to the public from today, Friday 27th February, for one month only! This is perfect if you want to spend some quality time with your gal pals and fancy doing something a bit outside the box. Download the Curls Best Friend app to book your time slots and treatments, as well as viewing photos shared from other visitors and more on Roller Lash! Alsoooooo, if you can’t make it to London, the Parlour will be going on tour from the 17th April! Mini cupcakes and champagne for errrrrrybody!! Will you be taking a trip to the Curls Best Friend Pop-Up Parlour?